Did you know Amazon has a price matching feature? Did you see a deal posted only to check the site for yourself and see a completely different price? Hopefully, this post will shed some light on the less than obvious features of Amazon. Don’t see the sale price? The deal may not be expired and you could be looking at a third party listing. Be sure to check the right side for “Sold by: Amazon.ca”. Amazon has a halfhearted price matching feature. On product page’s details section, you can find a link that says “tell us about a lower price?”. Click on it, fill out the form and hope Amazon adjusts the product’s price sooner rather than later. They won’t notify you of the change so you’ll just have to check back later to see if they adjusted the price. It’s not the price matching feature we’re expecting but it’s better than nothing. Only certain items are eligible for Amazon’s Release Date Delivery. 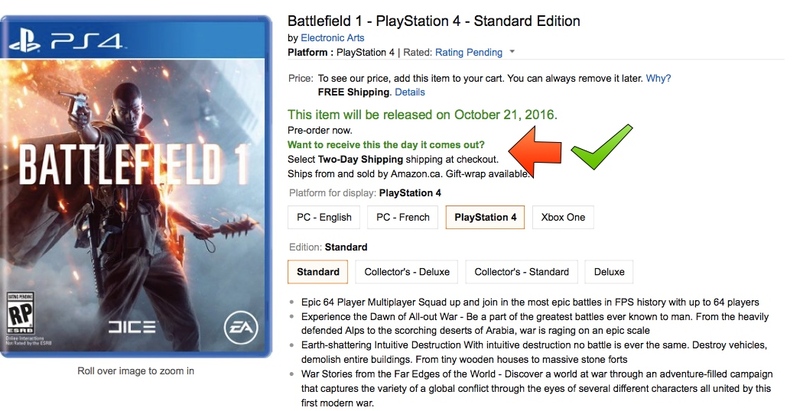 If you pre-order an eligible item as an Amazon Prime member, “Release Date Delivery” is automatically selected. If you don’t have Amazon Prime, you’ll have to select “Two-Day Shipping” and pay the additional shipping fee.